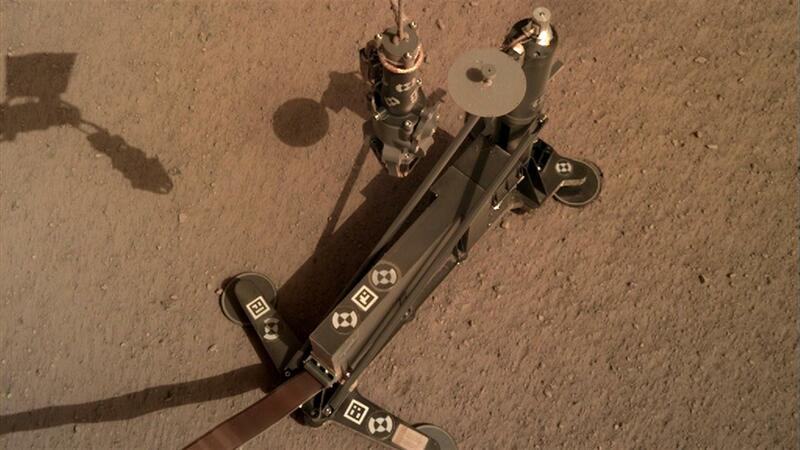 DLR's Mars 'Mole' HP3 on the Martian surface after being released by the InSight lander's robotic arm. Launched on 5 May 2018, NASA’s InSight spacecraft landed on 26 November 2018 just north of the Martian equator, and deploy its solar panels. SEIS, an instrument for recording seismic waves (left of image), and HP3, an instrument developed by DLR to measure the thermal conductivity of the Martian regolith and the heat flow from the interior of the planet (right of image), have been placed on the planet's surface. An artist's concept of InSight's heat probe, called the Heat Physical Properties Package, or HP³. This annotated cutaway rendering labels various parts inside of the instrument. A number of European partners, including France's Centre National d'Études Spatiales (CNES) and the German Aerospace Center (DLR), are supporting the InSight mission. CNES and the Institut de Physique du Globe de Paris (IPGP) provided the Seismic Experiment for Interior Structure (SEIS) instrument, with significant contributions from the Max Planck Institute for Solar System Research (MPS) in Germany, the Swiss Federal Institute of Technology (ETH Zurich) in Zurich, Switzerland, Imperial College London and Oxford University in the United Kingdom, and JPL. DLR provided the Physical Properties Package (HP³) instrument, with significant contributions from the Space Research Center (CBK) of the Polish Academy of Sciences and Astronika in Poland. Spain’s Centro de Astrobiología (CAB) supplied the wind sensors. On 12 February 2019 at 19:18 CET, DLR's Mars 'Mole' was released onto the Martian surface with the robotic arm of the NASA lander InSight. 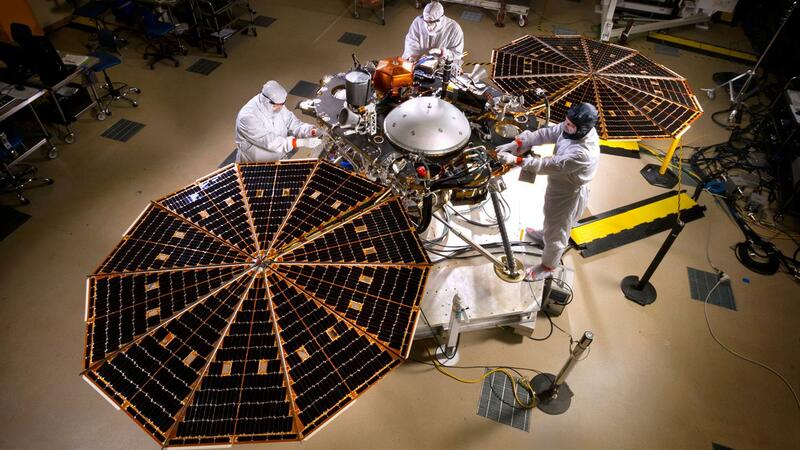 Lockheed Martin Space constructed the InSight lander for NASA. The InSight lander will carry two major experiments, the Heat Flow and Physical Properties Probe (HP3) and the Seismic Experiment for Interior Structure (SEIS), to Mars, where a robotic arm will place them beside the spacecraft after landing. 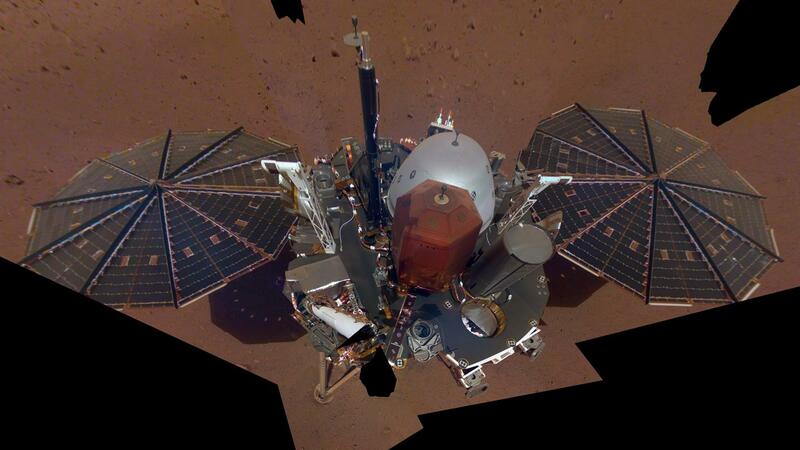 InSight's first complete 'selfie' on Mars. It shows the solar arrays and the platform of the lander. On the platform are its scientific instruments and the UHF antenna. DLR's HP³ (Heat Flow and Physical Properties Package) burrows into the Martian soil for the first time. The rod-shaped penetrometer uses a fully automatic, electrically powered hammer mechanism to drive itself into the subsurface. On 28 February 2019, the German Aerospace Center (Deutsches Zentrum für Luft- und Raumfahrt; DLR) ‘Mole’ fully automatically hammered its way into the Martian subsurface for the first time. In a first step, it penetrated to a depth between 18 and 50 centimetres into the Martian soil with 4000 hammer blows over a period of four hours. "On its way into the depths, the mole seems to have hit a stone, tilted about 15 degrees and pushed it aside or passed it," reports Tilman Spohn, Principal Investigator of the HP3 experiment. "The Mole then worked its way up against another stone at an advanced depth until the planned four-hour operating time of the first sequence expired. Tests on Earth showed that the rod-shaped penetrometer is able to push smaller stones to the side, which is very time-consuming. After a cooling-off period, the researchers will command a second four-hour hammering sequence. In the following weeks, with further intervals, they want to reach a target depth of three to five metres on sufficiently porous ground. 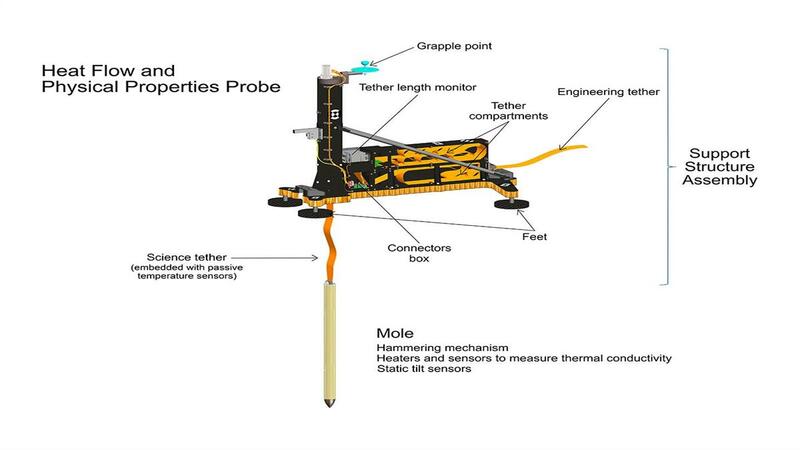 The Mole will pull a five-metre-long tether equipped with temperature sensors into the Martian soil behind it. The cable is equipped with 14 temperature sensors in order to measure the temperature distribution with depth and its change with time after reaching the target depth and thus the heat flow from the interior of Mars. The rod-shaped penetrometer uses a fully automatic, electrically powered hammer mechanism to drive itself into the subsurface. A rotating worm gear repeatedly stretches the main spring, which then produces a hammer blow. A second spring absorbs the recoil. 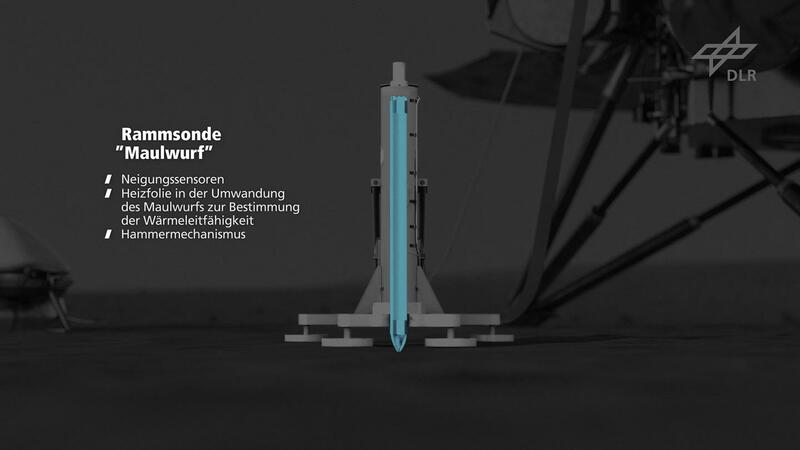 “You can imagine the Mars Mole functioning like a large nail that has a built-in hammer,” says Torben Wippermann from the DLR Institute of Space Systems, explaining the technology. The probe pauses after each step for about three Mars days (sols). It cools down for about two days after several hours of hammering, which causes friction and generates heat. Then, it measures the thermal conductivity of the soil at a sufficient depth for one day. “For this purpose, a piece of foil in the shell of the Mole is heated for several hours with a known electrical power,” says DLR planetary researcher Matthias Grott. “The simultaneously measured increase in the temperature of the foil then gives us a measure of the thermal conductivity of the soil in its immediate surroundings.” In addition, the radiometer mounted on the InSight lander measures the temperature of the Martian soil on the surface, which fluctuates from some degrees above zero degrees Celsius to almost -100 degrees Celsius. Later on, once the target depth has been reached, the data from the temperature and thermal conductivity measurements, along with the radiometer data, is received at the DLR control centre in Cologne, processed and then evaluated by scientists at the DLR Institute of Planetary Research. 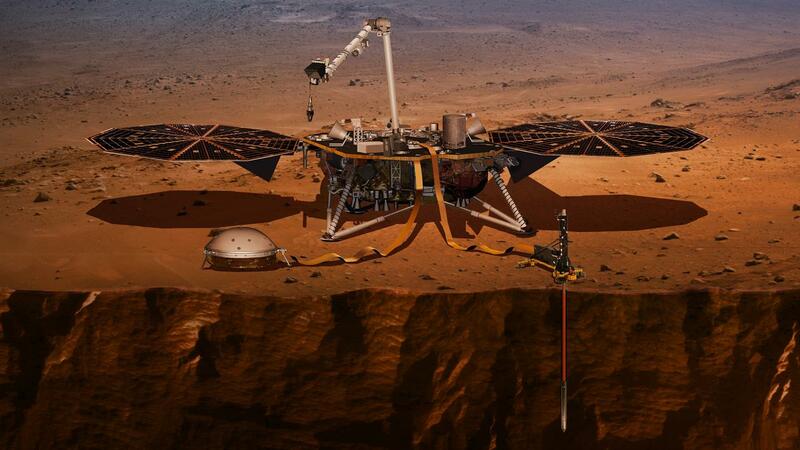 The InSight mission is being carried out by NASA’s Jet Propulsion Laboratory (JPL) in Pasadena, California, on behalf of the agency’s Science Mission Directorate. InSight is part of NASA’s Discovery Program. DLR is contributing the Heat Flow and Physical Properties Package (HP³) experiment to the mission. The scientific leadership lies with the DLR Institute of Planetary Research, which was also in charge of developing and implementing the experiment in collaboration with the DLR Institutes of Space Systems, Optical Sensor Systems, Space Operations and Astronaut Training, Composite Structures and Adaptive Systems, and System Dynamics and Control, as well as the Institute of Robotics and Mechatronics. Participating industrial partners are Astronika and the CBK Space Research Centre, Magson GmbH and Sonaca SA, the Leibniz Institute of Photonic Technology (IPHT) as well as Astro- und Feinwerktechnik Adlershof GmbH. Scientific partners are the ÖAW Space Research Institute at the Austrian Academy of Sciences and the University of Kaiserslautern. The DLR Microgravity User Support Center (MUSC) in Cologne is responsible for HP³ operations. In addition, the DLR Space Administration, with funding from the German Federal Ministry for Economic Affairs and Energy, supported a contribution by the Max Planck Institute for Solar System Research to the French main instrument SEIS (Seismic Experiment for Interior Structure). Detailed information on the InSight mission and the HP³ experiment is available on DLR’s dedicated mission site with extensive background articles. You can also find information in the animation and brochure about the mission or via the hashtag #MarsMaulwurf on the DLR Twitter channel. Tilman Spohn, the Principal Investigator for the HP³ experiment, is also providing updates in the DLR Blog portal about the activities of the Mars Mole.